One of the most romantic wedding venues in Scotland, Gilmerton House, invites engaged couples to discover the classic elegance of this country mansion and its tranquil surroundings, tastefully decorated interiors, beautiful furnishings and elegant antique furniture. The Wedding Open Day on Sunday 3rd February 2019 (12 – 4 pm) provides the chance to see this historical mansion house set for a wedding. Why not take a look round, discuss wedding plans and put any questions to the friendly team? 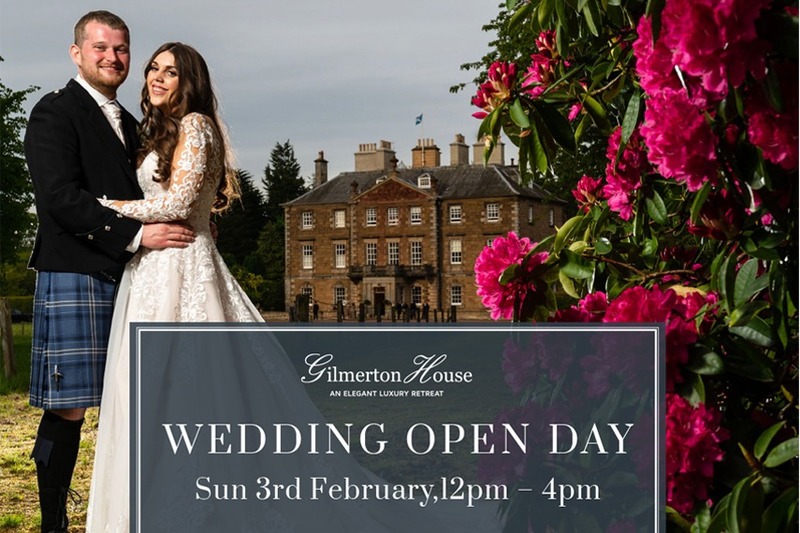 To book your place for Gilmerton’s Wedding Open Day, please contact the team via the website, emailing or calling on 01620 880 342. All guests who register in advance will be entered into a prize draw to win one of two bottles of Champagne. This 5-star stunning private country house is available for exclusive use, offering 10 rooms, a choice of 4 luxuriously appointed reception rooms, marquee site within exquisite gardens, selection of caterers and is only a short drive from the centre of Edinburgh. Home to the Kinloch family for over twelve generations, this 5-star luxury private retreat offers a high level of accommodation and service. The house offers a versatile venue for corporate days, lunches or dinners, weddings, incentive groups, golf and leisure groups, social events and much more.